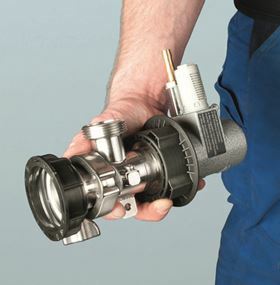 The MINIFLUX container pump is compact and light. It was designed for draining IBCs via their floor-level outlet and is an alternative to vertical immersion pumps. When accessing IBCs from above is impossible or very difficult, such as when containers are stacked or ceilings are low, the MINIFLUX enables pumping directly at the floor-level outlet. It is suitable for media with a viscosity of up to 1 000 mPas. In comparison to gravity draining via the IBC outlet tap, FLUX says the MINIFLUX enables a considerably higher delivery rate and delivery head. Depending on the media and motor, either up to 240 l/min can be transferred or a delivery head of up to 13 mwc can be achieved. This means that the media can be rapidly filled into the container or transported to an elevated container. FLUX will showcase the MINIFLUX at POWTECH, Nuremberg, Germany (hall 3A, booth 3A-208) on 19-21 April.